What Benefits Can Ganesh Mantra Bring You? All deities have a certain mantra or chanting associated with them. Om Gam Ganapataye Namaha is the Ganesh Mantra associated with Lord Ganesh – the elephant headed deity. Chanting of this mantra is associated with calling of the powerful energy of Ganesh, the Remover of Obstacles and the Lord of Beginnings. One of the most prominent deities in Hinduism is Lord Ganesh. When offering any form of prayer, His name is invoked before any other God’s name. This was a blessing he received from his parents Lord Shiva and Goddess Parvati. The name Ganesh is derived because he is the chief (eesha) of all the servers (ganas) of Lord Shiva. Lord Ganesh is referred to as the one with the single tusk, the one who has mouse as his vehicle and the one who penned the epic Mahabharata. Mantras are usually of Sanskrit origin, which are power-packed formulas, highly compressed and charged with a magical potency and deep meaning. Mantras can be a word, a sound or a phrase. It helps in elevating or modifying consciousness by its meaning, rhythm, tone, sound and the reflexology of the tongue against the palate of the mouth when saying the mantra. The following image shows the mantra, the meaning is O Lord Ganesha, the one with a large body, curved trunk and brightness of million suns, please always remove all the obstacles in my work. Chanting the Ganesh Mantra brings about a lot of changes in the person. It helps in calming the person and bringing overall positivity in life. A lot of aspects of life are impacted by the chanting of this mantra. The Ganesh mantra brings a sense of well-being in the life of the person. Indians refer to the Vedas or Vedic literature as the topmost authority with all kinds of knowledge. It is believed that every mantra has a specific meaning and brings particular result to anyone who chants the mantra. 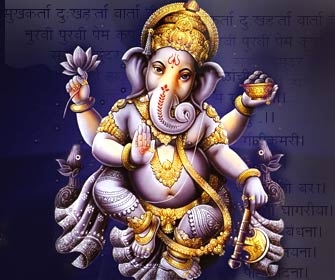 When a person chants the Ganesha Mantra it gives the person material and spiritual prosperity. All the obstacles are removed. Spiritual lifestyle adaptation helps in reducing health issues. There is improvement in capacity to work. Any problem or financial issue is resolved easily and usually with a financially cheap solution. Sudden and unexpected changes in life are prevented. Even when such changes occur, the Ganesh mantra makes the transition smooth. Chanting the Ganesh mantra regularly improves the discipline. Helps in cleaning and purifying the mind. Helps to relax and brings a positive feeling of peace and happiness. Deepens the level of meditation. Ensure that you are chanting while sitting in a comfortable position with your eyes closed. Focus on deep breathing – inhaling and exhaling and chant the Ganesh Mantra at least 11 times. The chant should be repeated 21, 51, 71, 91 or 108 times. For immediate results, multiples of 108 are considered the best. You can count the chants on fingertips, for numbers greater than 108, a rosary or japa mala can be used. Beads help in counting the number of chants and allow you to focus on the mantra. Once the recitation is complete, remain calm and you can feel the changes in mind and body. Remain seated for some time after the recitation of mantras are completed.